UNICEF has launched a remarkable fundraising campaign together with advertising agency Energize and mobile service provider CM. 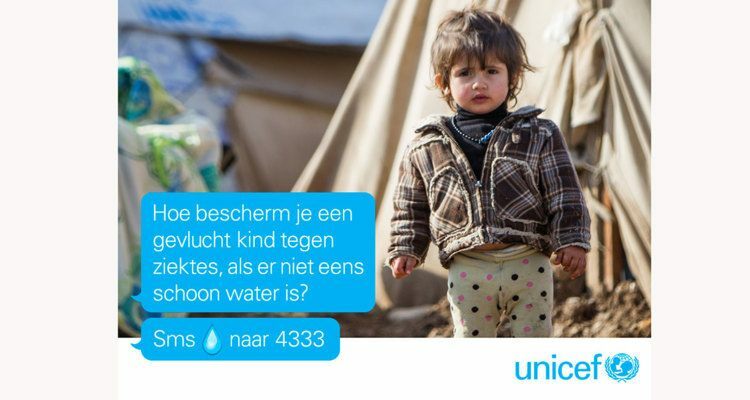 The Dutch campaign which raises funds to help refugees from Syria, Iraq, Turkey, Lebanon and Egypt, lets people donate through emoji's in text messages. Millions of children from these countries have abandoned their homes and schools to avoid the heavy consequences coming from war and fighting. Many of the refugees, men, women and children, have been travelling thousands of miles in their search for refuge. They often face hunger, sleeplessness and lack of education and fresh water. UNICEF makes every effort to prevent refugees, especially children, from being exposed to inhumane situations. In doing so, UNICEF needs funds to provide water, shelter, clothing, medical care and much, much more. The organisation wants people to donate money for these services through text messaging or via their website. To enhance engagement to their mission and to give it a deeper meaning, UNICEF have also made it possible to donate funds through emoji's in sms text messages. Some 15 emoji's represent the necessities that help refugees in Europe. Every single emoji stands for things the refugees need, like water, education, books, beds and food. The picture of a sleeping emoji represents a donation for a refugee to sleep better. Texting the emoji triggers a 3 euro donation. "Emoji's for donations tend be a more light-hearted way to support refugee children", UNICEF explains. "Also, using emoji's in the campaigns makes them more prominent when used in commercials and advertising. We hope this puts our campaign in the spotlight even more and persuades people to make a donation using the emoji's." The emoji campaign required some adjustments to the sms systems, as operators don't usually process sms text messages in A2P and P2A traffic. After a donation, UNICEF sends a thumbs-up emoji back and a second text message which leads to a website of UNICEF. Both text messages require different bit sizes and have to be sent subsequently. CM updated the way the systems read and draft sms messages, so the different bit sizes seamlessly corresponded to the right text message (emoji or plain text), for both mobile-originated (MO) as mobile-terminated (MT). Wendy Schilder, CM's market manager for Fundraising said “UNICEF's campaign is a great example of a new and engaging way of raising funds. Instead of the good old plain text message, donations can now be made by emoji's. A link in the MT text message a person receives after the donation, redirects them to a UNICEF website. That website tells the person which and how many emoji's have been used." How do you migrate dedicated savers with a savings card for your loyalty program as quickly and as efficiently as possible to your new app, and how do you get new savers to register as quickly as possible as well? With a national registration campaign and SMS marketing by means of an SMS short code. Texaco registered and moved thousands of participants of Texaco Stars from the Rocks savings card to the new mobile app. Most marketers use SMS to convince the receivers of an idea and have them take a certain action. For example, to buy a new dryer, sign up for an event or donate money to their charity. But how do you write a persuasive message that leads to the desired action when you are limited to 160 characters? Brewer Heineken decided to help men this year’s Valentine's Day and came up with an original surprise. What followed was a fun event with a small plane, an impressive message of love and SMS.